When low back pain persists for more than 3 months it is officially chronic. Many of my chronic low back patients however, have suffered for 2 or more years. Many of them have given up on ever overcoming their condition. Almost inevitably, patients only suffer chronic low back pain because they have never encountered a practitioner that is willing to treat them properly. Chronic low back pain should never exist. It is ALWAYS the result of NOT RECEIVING PROPER TREATMENT. Many doctors and therapists are happy to give temporary relief to their patients and accustom them to continually seeking care for the foreseeable future. And often, the notion of depending on your doctor/therapist for the rest of your life is encouraged. 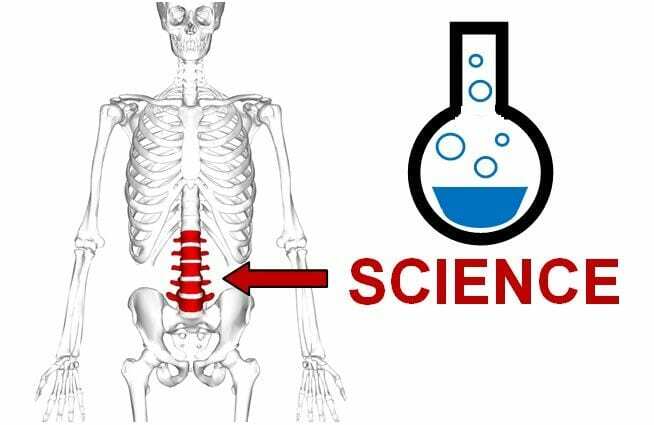 In this article I hope to show some of the science behind the proper treatment of chronic lower back pain. 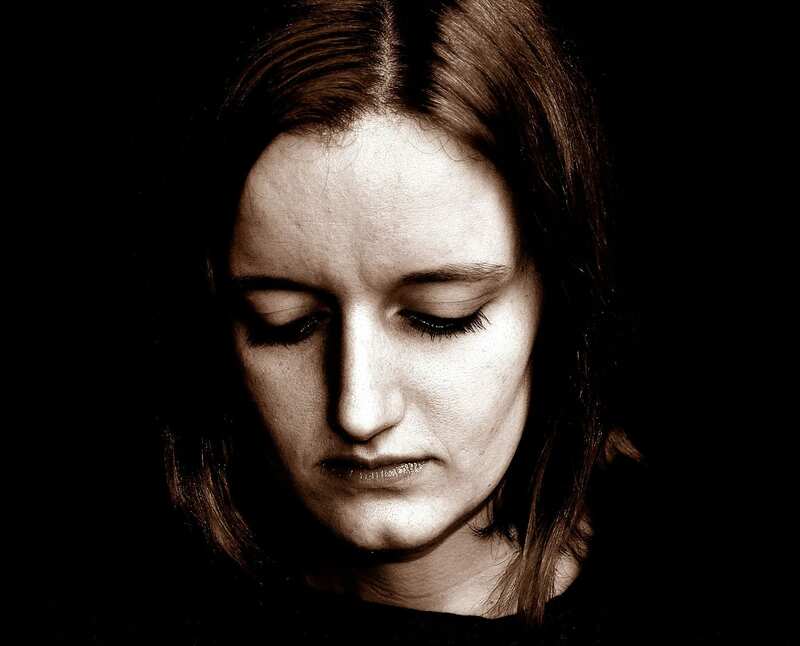 I pick chronic pain because it is usually trickier to fix than short term back strains. And it requires more work than simpler forms of low back conditions. WHAT CAUSES CHRONIC LOW BACK PAIN? The following are nearly always present in chronic cases of low back pain. If your approach to eradicating low back pain does not address all of the above, you will not overcome the condition. Obviously, a practitioner cannot strengthen your core for you, nor achieve flexibility for you or change your work habits. This will be something you will need to do. Hence the lack of popularity for the type of program that involves patients doing exercise rehabilitation. It is much more appealing to pay someone to fix you. And because of the temporary relief given by passive treatments (i.e. : massage, manipulation, physiotherapy modalities, drugs, etc) they are often the “go to” solution. Because the human body thrives when it is strong, flexible and active, no chronic pain will ever disappear without those elements. And obviously, this type of therapeutic approach is mostly comprised of the patient doing the work. So the bad news, you are going to have to work and change your lifestyle if you truly desire to put low back pain behind you. The good news is… you can overcome even years of chronic low back pain. YOU SAID SCIENCE. WHERE’S THE SCIENCE? When the lumbar spine is in a chronic state of pain, the disc is almost always involved. Even if it is not bulged or herniated, it can be applying pressure to the bone immediately above or below (or both). Over time, this can cause micro stress fractures in this bony region — known as the endplates — and with that comes pain. What causes this excess pressure? 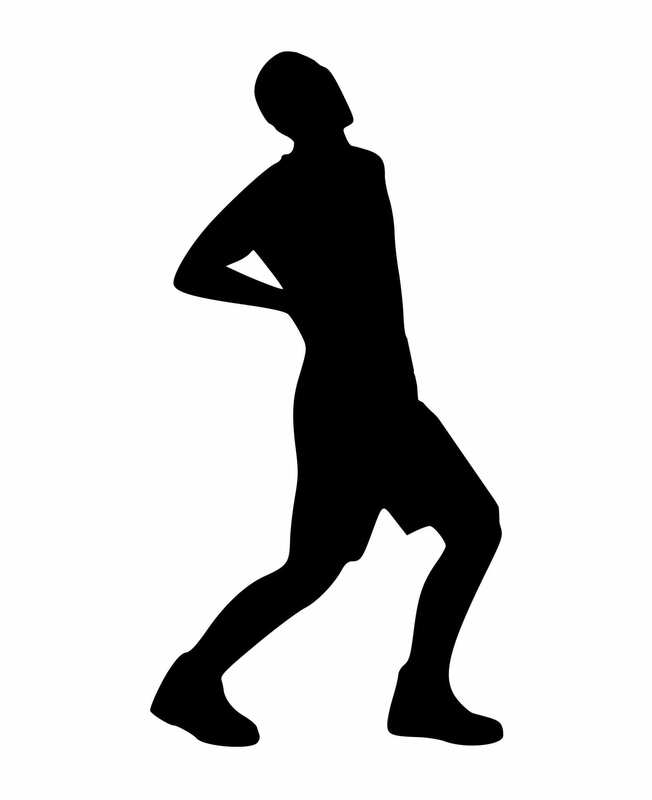 Poor posture, poor lifting techniques as well as lack of movement (sedentary lifestyles) are major causes. 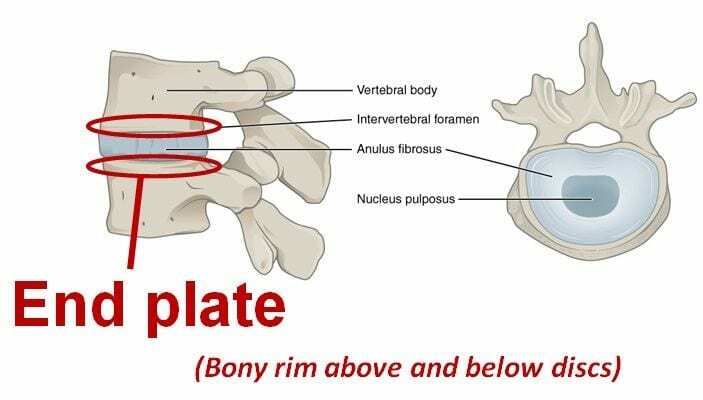 Spines transfer stress very well if they are used appropriately, but improper use will change the way stress goes through this unit and micro damage accumulates either in the disc, the soft tissue surrounding it or the bones of the vertebrae themselves. With pain comes the instinct to be less and less active and to reduce range of motion. 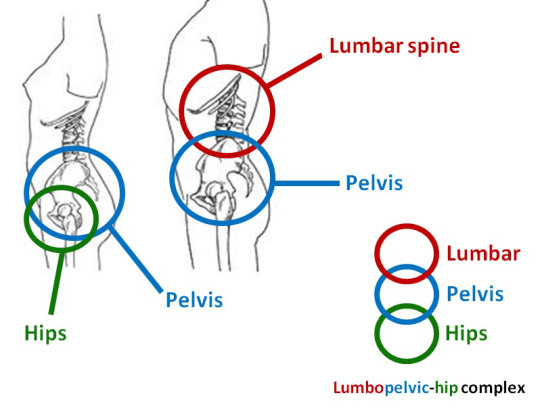 As a result the lumbo-pelvic hip complex looses flexibility, co-ordination and strength. Unfortunately, this causes secondary pain such as muscular strains in the low back and hips. Also, this inactivity tends to exacerbate the original low back pain as well. Essentially, the biomechanical chain is not only weakening but the lack of flexibility and co-ordination means that every time you lift or perform a sports motion, the joints in this complex are experiencing more and more wear and tear. Your muscles, ligaments, tendons, fascia as well as joint cartilage are parts of a complex machine. And like any other machine, there needs to be co-ordinated interaction between all moving parts. And as a living biological system, too little or too much stress will be harmful. Once you have had the exact cause of your pain diagnosed, a customized program of exercise rehabilitation, hands-on treatment and ergonomic changes is the most effective and evidence-based method to cure your back pain. Even if it has been a part of your life for years. 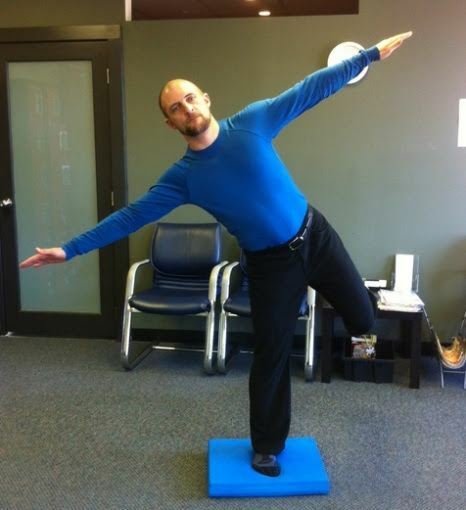 See our exercise rehabilitation section of the clinic’s website for pricing and scheduling details. A proper program will have you start with very basic exercises and stretches. Yet, the goal of our protocol is to slowly and safely evolve you to being able to safely perform compound movements such as deadlifts, squats and olympic type lifts. Prioritizing safe technique and NOT excessive heaviness, lifting in these fashions will allow you — and your lumbopelvic hip complex — to be able to lift, work and play all the while keeping your back strong and healthy. Contact us if you are interested in more details. Thank you! We’ve all heard the term self-care in conversations with friends, doctors, co-workers or family members—but do we really know what it means? Self-care is more than just managing our health by taking the time to practice good hygiene or exercise regularly—though those are important parts. Self-care is about taking deliberate action to show compassion and consideration to ourselves, making healthy choices for our physical and mental well-being. Create a meditation space: Whether you transform an entire room or just a quiet corner, a space designed for meditation is a powerful self-care tool. Studies show that meditating for as few as 10 minutes a day reduces stress, anxiety and depression. Get plenty of sleep: Sleep is crucial for healthy brain function, including concentration, decision-making and productivity. Commit to a bed time that gives you at least 7 to 9 hours. Go to bed 15 minutes early to give yourself time to relax and get comfortable. Say no: Your list of responsibilities is long, so self-care sometimes means saying no to some items on your to-do list as well as other people’s requests. If your coworker asks you to take on an assignment that will increase not only your workload, but also your stress load, give yourself permission to say no. It might be painful at first, but when you overcommit yourself, the quality of your work suffers, not to mention the quality of your life. Reduce stress: In our overbooked lives, many of us operate at full steam all day, every day. There is an intense amount of stress that comes with living out of our sympathetic nervous system—more commonly known as fight or flight. This means we are regularly dealing with life from a place of heightened stress. Taking more time to relax—in general and in the moment—can reduce stress, and reducing stress can help you avoid negative behaviors many people use as coping mechanisms. Practice breathing deeply and with intention in high-stress situations. Let go of harmful, negative emotions that damage your self-esteem. You can also reduce your overall feelings of stress by practicing yoga, exercising regularly, getting a massage and meditating daily. Do something you enjoy: At least once a day, carve out time to do something you really enjoy. It can be as simple as enjoying a cup of your favorite coffee on your back porch to grabbing lunch at your favorite downtown deli. Take at least 30 minutes out of your day — every day — to focus on doing something simple you enjoy. Get rid of clutter: Live in a space full of meaning and intention by removing unnecessary distractions from your home—and your mind. Get your home organized to feel a sense of openness and freedom, while also eliminating the stress of having to rummage through five different catch-all drawers until you find an extra battery. There’s an app for that: Download a self-care app on your phone, one that encourages you to pause, breathe and think. The use of these apps surged in 2017, showing that developing mindfulness strategies and letting go of stress are common goals in our lives. When we prioritize care and concern inward, we are far better at extending it outward. Self-care encourages us to do more than simply live life, but to also enjoy life. We can find strength to live to our potential and always be on course with our true purpose when we prioritize self-care. In our modern world of mobile devices, a new neck injury has arisen. 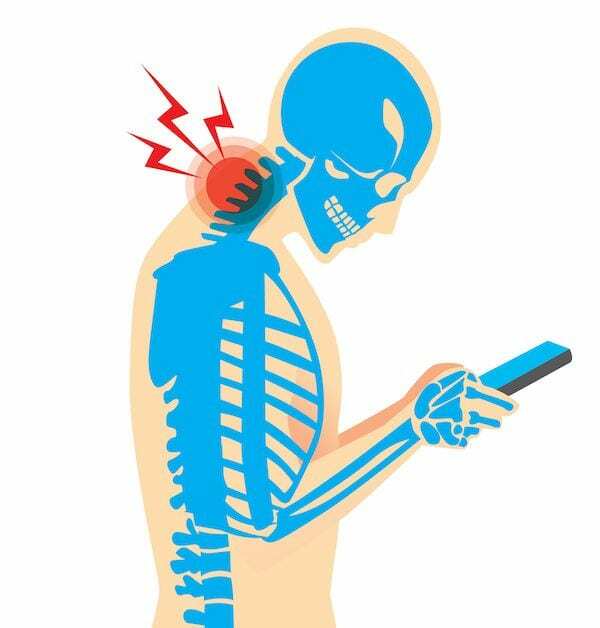 Referred to as “text neck,” it results from the forward flexion of the cervical spine as you look downwards on your mobile device. As you can see in the above picture, the individual’s neck is bent forward as he or she spends hours per day perusing work emails, apps, games and social media. This places the spine in a position that is unnatural and places undue pressure on the spinal discs as well as the muscles running from your upper back to your neck and skull. Evenutally one or both of these systems will begin to be symptomatic. As you can see below, the natural position for the neck is straight, with a slight backward curve. 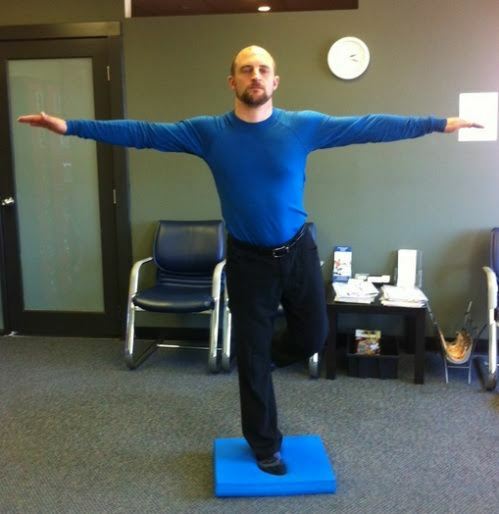 This allows the muscles to be in a normal position and the right amount of pressure to be placed on the discs. Think of text neck as essentially a slow motion whiplash. And if left unchecked, it can result in an unnatural loss of curvature in the cervical spine as well as disc bulging and nerve impingement. There are ergonomic ways to use your mobile devices and you should be well versed in them. Don’t wait for the problem to worsen, get diagnosed and treated and change your habits. You don’t want a serious neck condition in 5 to 10 years! 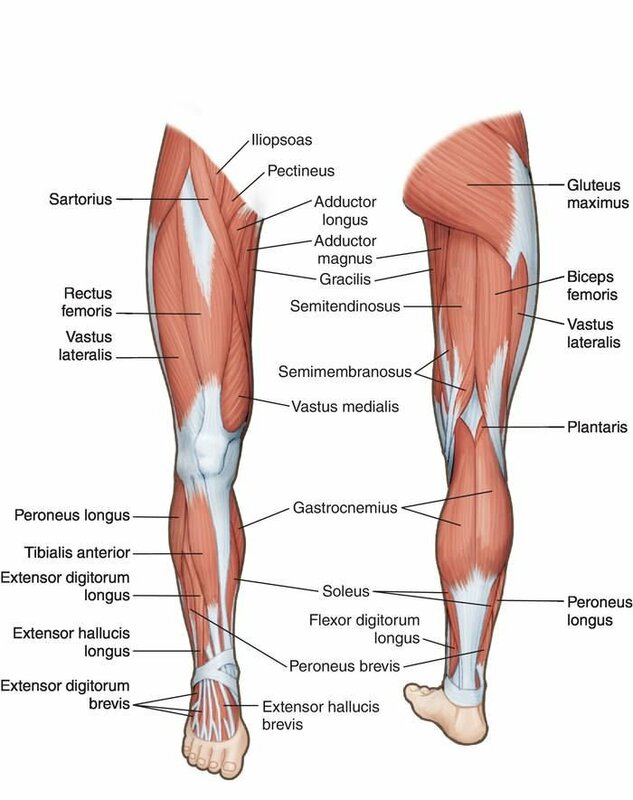 First things first, let’s show you where the peroneus longer and brevis are (peronei tendons). See the picture below. The two tendons come down the outside of your calf and ankle and are tucked behind the big ankle bone that sticks out on the outside of your ankle. As you can see, they then travel down in an L shap and plug into your foot bones. On the other hand, the ligament involved in an ankle sprain is the anterior talofibular ligament. It is right in front and below the big ankle bone. So, if the pain is not in front of the outside ankle bone, it can’t be a peronei tendonitis. Now, the way in which you hurt your ankle also tells you what’s going on. If you hurt your ankle by rolling it, most likely you have a sprain AND the pain is right in front and below the big outside ankle bone, you most likely have a sprain. 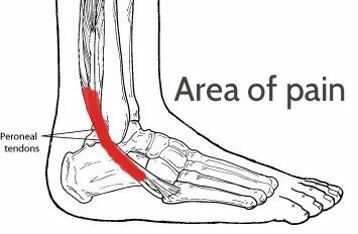 It is possible to strain the peronei with an ankle roll, but much less likely. 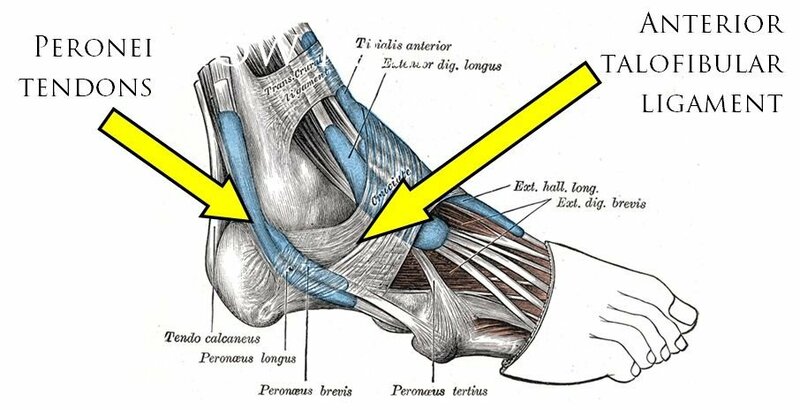 When rolling the ankle affects the peronei and not the ligaments, the pain is usually where it plugs into the bone of the foot (see pic above). This will not be right next to the big ankle bone, but in the tip of the bone of the foot. Most of the time you have a proper peronei tendonitis is when you didn’t hurt yourself instantly, but started developing pain for no known reason. And the pain will be behind the ankle bone and sometimes even up the outside of the calf. How you treat the injury depends on what the injury is. So make sure to have your ankle region pain properly diagnosed! Do You Know Your Headache? 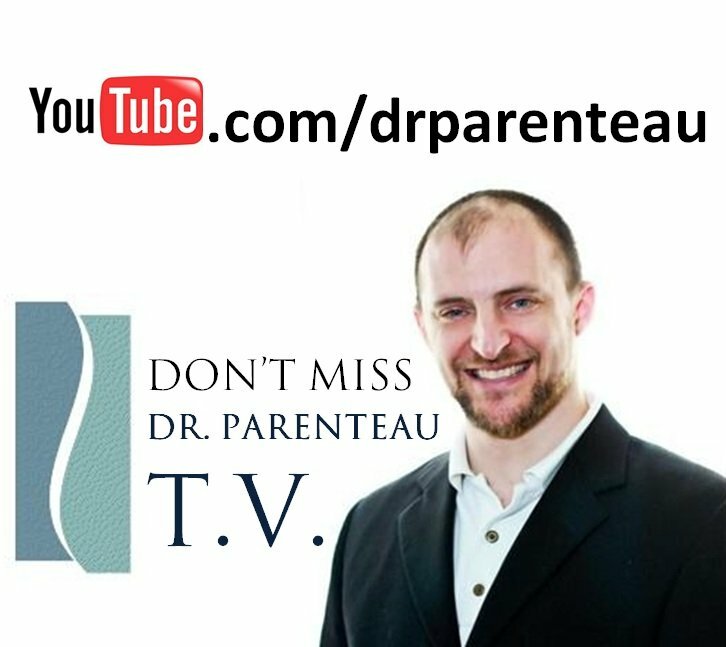 A very important question, see our video below OR our article on this subject! Also, you may want to check out our headache diet article. What Does A Chiropractic Adjustment Even Do? 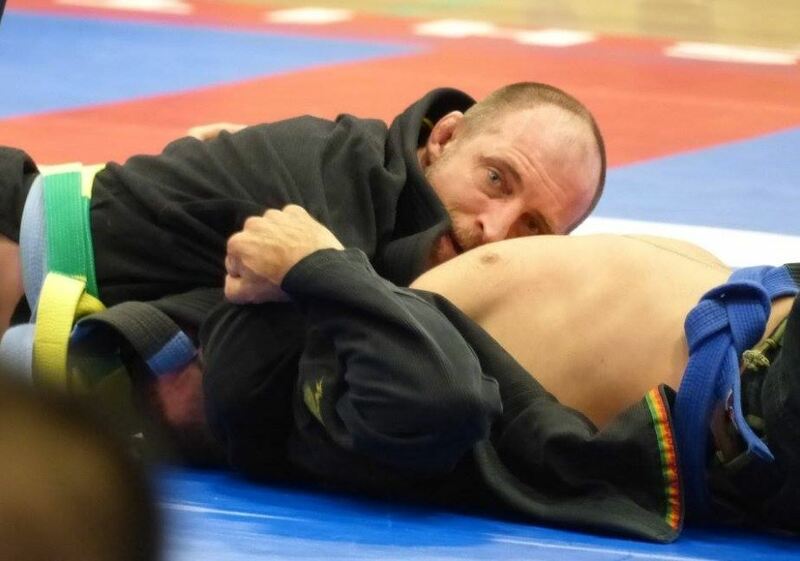 I have been asked this a thousand times, so I am going to give you, the would-be patient, a quick low down on joint manipulation. First, much like medicine, nutrition and chemistry have been with us for thousands of years, so has joint manipulation. For example, the ancient Chinese used it to correct for pain and inflammation. As humans are wont to do, if something works we keep doing it. Over the millennia we have scientifically understood and improved spinal manipulation. Modern day chiropractic is not the chiro of one hundred — or even twenty — years ago. Easy answer: unlocking a locked joint. 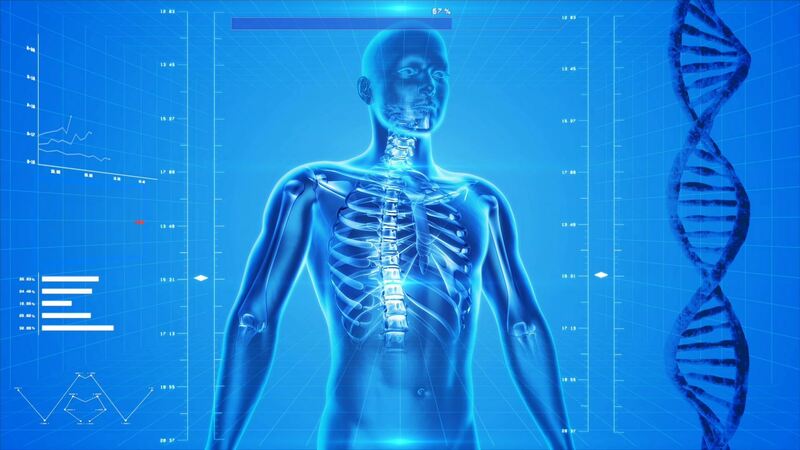 When we suffer an injury — either a sudden injury, or a slow, over use injury — the sophisticated neuro-muscular system will use postural and structural muscles to lock a joint down. Preventing full and free motion. Unfortunately, the body tends to over do this response. As a result, other nearby joints suffer as well and the problem can grow. For an easy demonstration try walking around without bending one of your knees. You will be forced to change how the whole body chain works in order to compensate for one single locked joint. It can take a few visits to properly retrain the brain, but it is highly effective. And in some conditions (e.g. : facet imbrication) it can even be accomplished in a single visit. Most people will encounter an issue in their life time that will greatly benefit from joint manipulation. Headaches: According to the American Headache Association, tension-type headaches are, by far, the most common form of headaches. They can be as debilitating — and even more so — than standard migraines. Fortunately, most tension-type headaches are due to tension and restriction in the neck region of the spine. As a result, manipulation is an integral part of treatment for this ailment. Low back pain: One in four North Americans will suffer a bout of lower back pain in their life time. And low back pain is the most common cause of worker’s disability for those under the age of 45. Several government studies over the past few decades have shown joint manipulation to be superior to surgery, injections and prescription medication for treatment of low back pain. The Agency for Health Care Policy and Research (AHCPR) of the US Department of Health and Human Services released a 1994 study stating that joint manipulation was a safe, inexpensive treatment that was more effective than standard medical approaches. It was not done by a chiropractic association but by a government assembled panel that included 23 diverse specialists comprised of medical doctors, chiropractic doctors, nurses, experts in spinal research, physical therapists, an occupational therapist, a psychologist, and a consumer protection rep. The Ontario Ministry of Health (government) commissioned study is the largest standing study on low back pain treatment. Dubbed the “MANGA Report” it made the bold statement of recommending chiropractors as the first line of care ahead of medical doctors! Several other studies have been done, nearly all of which have come to the same conclusion: for certain injuries, manipulation is the least expensive and most effective treatment. Now, that being said, not all ailments require manipulation. For these other injuries and pain conditions we use a variety of physiotherapy techniques as well as exercise-based solutions and soft tissue treatments. You need your practitioner to think outside the box and apply the treatment best suited for your problem. A fence at the top of the hill instead of an ambulance at the bottom of it. **Do not start this program without first being examined and prescribed a beginner program. This is NOT a beginner program. 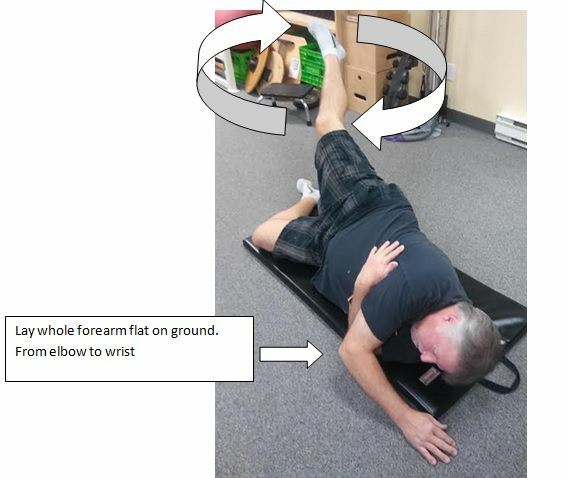 Stabilizing the knee via exercises is an important injury prevention technique that most people do not incorporate enough into their routine. Many sports place strain on the knee and therefore can cause injury. You cannot strengthen ligaments or joint cartilage. It simply is what it is. 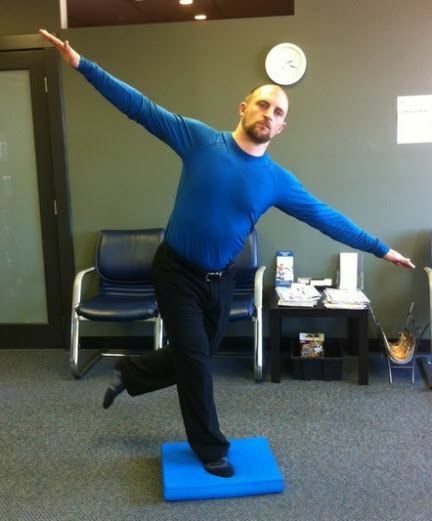 However you can strengthen tendons and muscles and improve flexibility and co-ordination. There is no better injury prevention for the knee than a 2 to 3 times per week stability program. We cannot ignore any aspect of the leg structure, from the core down to the ankles, as they all have an impact on the efficacy of knee movement. Please do these exercises after a proper warm up (e.g. : 5 minutes on the eliptical). Advanced Core Control: balance while transfering ball in crucifix position. Go as long as you can. *this is a core coordination movement NOT a 6 pack builder. Body smarts not just body strength. – Lie on your side. – Point toe of top leg. – “Draw” as large a circle as you can by moving leg in a circle. – Go as far UP and BACK as possible.